Part cloud, part sun and a nice south westerly breeze that had a few light patches in it to keep competitors on their toes. Perfect conditions to open the Autumn series. 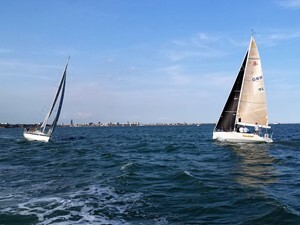 Tinker T took charge of Race 1 as SOOD and set a longish windward / leeward course of a beat across the east going tide to Quarr off Wooton Creek and a run with the tide back home. With 8 entries the starts were combined which will remain the case for the rest of the series. This may cause a few wrinkled brows with the slower first start yachts who remain unscathed as far as SOOD duties are concerned up to this point in the season. The start saw an even spread along the line as different strategies for the beat came into play. Some boats sacrificing precious weather gauge for a tidal advantage inshore and others opting to go hard left across to the Island side for tidal shelter there. In a handicap fleet it is sometimes difficult to see which option worked the better however Tinker T who opted initially for the mainland shore rounded the windward mark first closely followed by Sunshine and Jolly Jack Tar. The Sigma 33's had opted for separate strategies and Happy Apple rounded first ahead of Spirit of Kudu. On the run home the symmetric kites trundled down the rhumb line whilst the asys banged the corners at speed but alas for JJT the symmetrics prospered on this occasion. It was good to see Kurketrekker out albeit shorthanded but the bright pink kite hung on in there and brought the reward of an NHC bullet.